If it would not be suspected of flattery, I could tell the world what an acquaintance with Scripture, what a knowledge of religion, what a memory of divine things both in verse and prose, is found among you; and what a just and regular account is given of sermons at your age; to awaken all the children that shall read these songs, to furnish their memories and beautify their souls like yours. The honour you have done me in learning by heart so large a number of the hymns I have published, perhaps has been of some use towards these greater improvements, and gives me rich encouragement to offer you this little present. The most enduring of these hymns was no. 2, “I sing th’ almighty power of God,” which was headed “Praise for creation and providence.” The full text spans eight stanzas of four lines. Fig. 1. Divine Songs Attempted in Easy Language for the Use of Children (London: M. Lawrence, 1715). Text: Analysis. The hymn is not a paraphrase of any particular Scripture, but its imagery draws from a number of passages, such as Genesis 1, Job 26, Psalm 19:1-6, Psalm 104, Psalm 107:23-30, and Psalm 139:7-8. The opening line, with its elision “sing th’ almighty” is sometimes altered in hymnals to the simpler “sing the mighty.” In doing this, God is very slightly demoted from “almighty” (omnipotent) to simply “mighty,” although “mighty” is still a valid biblical adjective. This hymn, in its abbreviated form, shows the best side of Watts’s book, and has become a simple response to the created world that allows both admiration and gratitude, together with an admonition not to forget God. It is the best kind of children’s hymn, written with simplicity and also with dignity, so that it can be sung without embarrassment by adults. Judged by modern standards, Watts’ genius in hymnwriting did not extend to children, and it is easy enough to make fun of some of his old-fashioned expressions, as in Lewis Carroll’s delightful parodies. But Watts pointed the way for others, which is what he was trying to do, and his pioneer endeavors deserve grateful recognition. Tune 1. The meter of this text gives it a great versatility in musical settings. In the United States, the most common setting is ELLACOMBE, a German tune dating to about 1827. Tune 2. Another popular setting in the United States is FOREST GREEN, a folk tune collected and adapted by Ralph Vaughn Williams for The English Hymnal (1906) and paired with “O little town of Bethlehem.” The connection between Watts’ text and this folk tune dates as early as 1974 in Hymns for the Living Church. Tune 3. In the British Isles, one common tune pairing for Watts’ text is MONTROSE, first printed in Laurence Ding’s The Scholar’s Assistant, 2nd ed. (Edinburgh: Laurence Ding, 1786), where it was called MATHER / NEW ABERDEEN (Fig. 2 | image pending). The name MONTROSE followed shortly thereafter in James Thomson’s Collection of the Best Church Tunes, 2nd ed. (Leith: George Peattie, 1789) and has become the preferred name. According to the editors of the Companion to Church Hymnal (2005), this tune “was almost forgotten until Sir Henry Walford Davies incorporated it into the royal fanfare music that he arranged for the coronation of King George VI in 1937 and which was repeated for that of Queen Elizabeth II in 1953. Since then it has become more widely used.” The connection between MONTROSE and Watts’ text was made by Congregational Praise (1951) with a musical setting by Eric H. Thiman, then repeated in other collections. Tune 4. ST. SAVIOUR, by Frederick George Baker (1840–1919), originally composed for “Hark the glad sound! the Saviour comes,” published in the Bristol Tune Book, 2nd ed. (1876). Baker was organist of St. Saviour’s Church, Shanklin, Isle of Wight. He was a lifelong resident of the island. 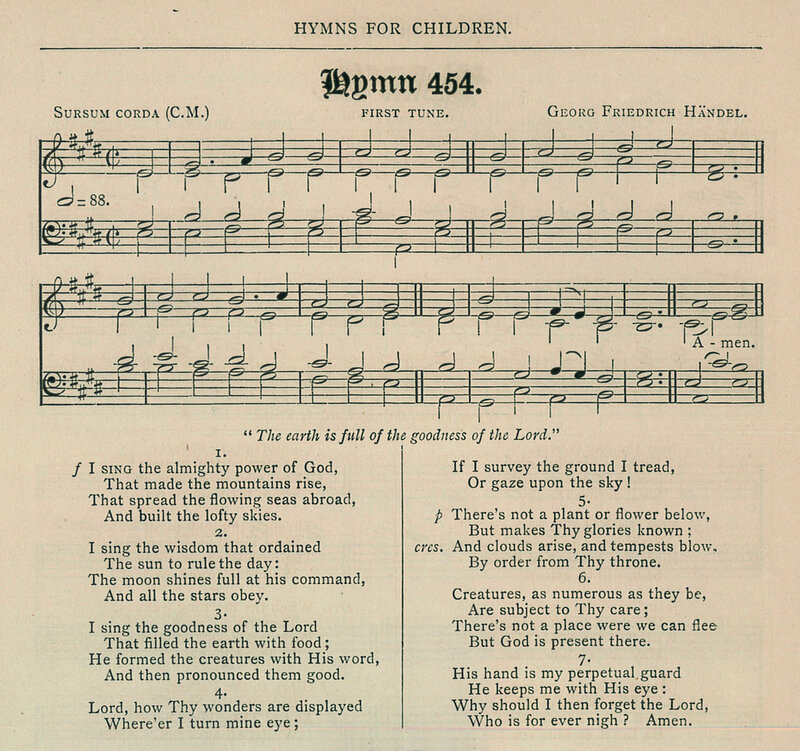 In British Methodism, the connection between this tune and Watts’ text dates to the Methodist Hymn Book of 1904. Tune 5. Since 1873, the preferred tune for Watts’ text in the Church of Ireland is SOLOMON, by George Frederick Handel (1685–1789), from the air “What tho’ I trace each herb and flower” (Act 1, No. 10) in the oratorio Solomon, HWV 67 (1748 | Fig. 3). Fig. 3. Georg Friedrich Händel’s Werke, vol. 26 (Leipzig: Deutschen Händelgesellschaft, 1867), pp. 76-79. Fig. 4. Samuel Arnold, Psalms of David for the Use of Parish Churches (London: John Stockdale & George Goulding, 14 Oct. 1791). In the 1873 edition of the Irish Church Hymnal (Fig. 5), the tune was called SURSUM CORDA, paired with Watts’ text. Every subsequent edition of the Church Hymnal has repeated this pairing. Fig. 5. Church Hymnal (Dublin: APCK, 1873). J.R. Watson, “I sing the almighty power of God,” An Annotated Anthology of Hymns (Oxford: University Press, 2002), pp. 138-140. J. Ithel Jones, et al., “I sing the almighty power of God,” The Baptist Hymn Book Companion, rev. ed. (London: Psalms and Hymns Trust, 1967), p. 96. Edward Darling & Donald Davison, “I sing the almighty power of God,” Companion to Church Hymnal (Dublin: Columba Press, 2005), pp. 78-80. K.L. Parry & Erik Routley, “I sing the almighty power of God,” Companion to Congregational Praise (London: Independent Press, 1953), pp. 20-21. J.R. Watson & Kenneth Trickett, “I sing the almighty power of God,” Companion to Hymns and Psalms (Peterborough, Methodist Publishing House, 1988), pp. 215-216. Paul Westermeyer, “FOREST GREEN,” Hymnal Companion to Evangelical Lutheran Worship (Minneapolis: Augsburg Fortress, 2010), p. 16. Carl P. Daw Jr., “I sing the mighty power of God,” Glory to God: A Companion (Louisville: Westminster John Knox, 2016), pp. 35-36.